When Indigenous knowledge keepers learned about DNA, they saw a clear synergy, she said. "It's literally instructions in our blood." She turns to epigenetics, where people are discovering there are proteins around DNA that can essentially turn these instructions on and off. Scientists are finding that if people experience trauma, these proteins can change. "Suddenly, the instructions can't get out," she says. "I have to be careful, you should call a molecular geneticist, but that's my analogy." Scientists were looking to examine Indigenous people's DNA to see this link because they know they've been through so much trauma, she says. The idea of blood memory, she says, is that even if she isn't taught by an elder, she can just stop and lesson "and learn how to be a good Cree-Metis woman, because it's in my blood." The idea of blood memory "encourages me to be hopeful, because we have this huge task. We don't know if we can preserve our culture, our language. But it makes me hopeful." Turning back to biology, she says the issue with how trauma impacts proteins near DNA is that this damage can be passed on to children. "What I'm interested in is if there are processes of repair," she says, noting that every generation has a chance to heal. She says that epigenetics may need to catch up: "our elders are already saying what supports the repair. That's the high-quality early relationships." She says there is work being done around this in the scientific community. Big Canoe asks if focused research on repair of epigenetic damage, rather than focusing on harm, would be helpful. "Yes," says Smylie. We will now move to commissioners' questions. Commissioner Michele Audette, joining via Skype, is up first. Speaking in French, Audette says she doesn't have too many questions. "You always surprise me with your knowledge, and it's a lot to assimilate," she says. Audette asks how Smylie would recommend combining Indigenous and non-Indigenous worldviews. "I guess the piece that I would contribute is to highlight the work around acknowledgement of social positioning," she says, speaking about cultural safety training. "The people who have come to what we now call Canada haven't experienced equal sharing of resources," she says. "There's an unequal distribution of health and social resources." While Canadians like to believe they have equal access to health care, she says, "the fact is we don't." If we don't acknowledge this inequality, Smylie says, we can't begin to correct it. This begins by being aware of one's own social positioning, and aiming to level the playing field in individual interactions. "We have this ugly human tendency that many of our organizations have been founded on, which is racism," she continues. "It can enter into our minds that people who look different than us are to be feared." Smylie says we need to listen to principles from elders about equity. "Maybe those seem like simple lessons," she says, "but just because I want it to be so doesn't mean it will be so. Just because I'm a medical doctor doesn't mean I'm not racist." She says people need to be aware of their own biases and actively confront them. Audette's second question is whether research shows that if Indigenous women control the power over their own health and resources, does it have impacts on health? Smylie says yes, there is. She adds that several studies regarding control are done in a non-Indigenous context. However, it's emerged as a significant factor in things like pre-term birth. Studies show that Indigenous women with more control are less likely to give pre-term birth. Social capital does have an impact on health. Studies are usually framed as a deficit - negative impacts of people not having social capital - but Smylie says she believes there's literature that would show having social capital would be protective against medical and physical health outcomes. "But more generally, the answer is yes," she says. "I want to say thank you very much," says Audette. "You're an amazing human being. I'm very proud that you're Indigenous." Commissioner Qajaq Robinson is next to ask questions. "As someone who's written proposals for grants, I'm sure you can appreciate that goverments like the dots connected for them," Robinson begins. She begins by asking whether health indicators and social determinants of health are the same things. "Yes and no," says Smylie. "They're overlapping." Health indicators are measures of health, like illness or happiness measures, she explains. Social determinants of health are external factors that impact health, like income, education, housing, food security. These are typically measured in a non-Indigenous context. "We have many other indicators that could be important," she says - things like access to culture, access to language, etc. Robinson asks how both of these concepts address violence specifically - causes and responses. "You can tell I'm thinking about this in the context of 'how are we going to make the governments understand,'" she says. "Coming up with the relevant indicators is a distraction technique," says Smylie. "Keep in mind these are only milestones. They're not doing anything... we know what the indicators are already. It doesn't get us to doing things." Governments spend a lot of time arguing about what markers should be and not addressing the root cause of the problem. "In my mind, the federal government is using this whole emphasis on indicators, it's a distraction from doing this stuff," she says. "It's empowering to hold the measuring stick, but then you need to use it." She says if the commission was tasked with coming up with indicators, she wants a commitment that afterward something "was actually going to happen." "The goal is that First Nations, Inuit and Metis women and girls be safe from violence. In order for that to happen, we're going to need systems in place... where if there were threats to safety or violations to safety, there was appropriate remediation." She talks about indicators as a way of marking progress. Keep track of the number of Indigenous babies that die in childbirth, but also the number of Indigenous midwives, number of babies born in Indigenous communities, etc. "We've heard about the impacts of overcrowding," she says. "So can we work on measures to create stability in homes. These basic things that we need." Robinson asks about the ignorance of Mongolian Spots, and people seeing them as an indicator of violence. A number of women have asked her to bring it up, she says. Smylie says it requires education: "my medical training was done on the assumption that everybody has white skin," she says. Robinson's final question is about vacating space. Smylie agrees that this important for not just land, but also positions of power and influence. We're on now to commissioner Brian Eyolfson. There's a bit of urgency in the room to make sure we wrap up quicly in order to get Smylie to the airport in time (flying is, as always, serious business in Iqaluit - weather delays are common and there are few flights out to begin with). Eyolfson thanks Smylie but says he has no further questions, and passes the microphone to commissioner Buller. "I do want to keep you, and I have some power, but not enough to hold aircraft," she says. She has no further questions. The commissioners present Smylie with gifts of an eagle feather and tobacco before she leaves for the airport. There's applause from the room as she completes her testimony - a sign of the deep respect those in attendance have for the work she's done. You can absolutely see and feel why in the room. Dr. Smylie is a really inspiring presence - you're not often around people with the breadth of knowledge she displayed. It felt like an absolutely exhaustive list of topics were covered during her testimony and cross examination. We're now on a lunch break until 1 p.m. ET. When we return, the third and final panel of this week's hearings - on Aboriginal Decolonizing and gendered Aboriginal Perspective, will begin. Jeffrey McNeil-Seymour is the scheduled witness. We're back and just getting set up to begin the third panel. 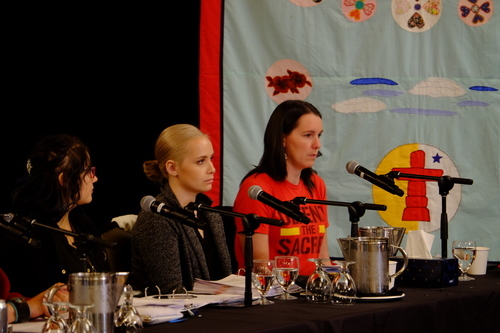 Scheduled witnesses are Jeffrey McNeil-Seymour, an elected family representative for the Traditional Family Govrnance Council for the Stk'epmlupsemc te Secwepemc Nation, and Jasmine Redfern, program coordinator for the Aboriginal Youth Project at the YouthCO AIDS Society. The theme for this third and final panel is Aboriginal Decolonizing and gendered Aboriginal Perspective. People are just getting settled here and then we'll get underway. Just getting underway now. There is also a third witness the at was not on the program schedule - TJ Lightfoot, a two-spirit Mik'maw youth. We've also been informed that Jeffrey McNeil-Seymour is on his way in from the airport and will join the panel once he is settled in. A point of clarification - TJ goes by the pronouns they and them, so I will be using those when writing about them in this blog. TJ is going through their experience now. They are a youth services worker for the Government of Nunavut and has previously done front-line work in Nunatsiavut. Their educational background includes the impact of the environment on Indigenous women. Jasmine Redfern is from Iqaluit, a second year student in environmental law, and was previously a health policy analyst. Both Jasmine and TJ have experience working with a youth sexual health network, educating Indigenous youth on HIV, mental health and addiction. Should note that Jasmine previously worked with YouthCo AIDS Society, not currently, as I said before. There is no bio info provided for these two witnesses, so I am doing my best to catch all I can from their introductions. Redfern is sitting on the centre, TJ on the right - commission counsel Shelby Thomas, who will be leading their testimony, is on the left with the red glasses. The two witnesses will be testifying together. The two begin by talking about the experience of LGBTQ2 Indigenous people. Lightfoot says that many 2-Spirit Indigenous people have their own experiences compounded - having to come out multiple times or being unable to access services geared towards Indigenous LGBTQ2 people. It's usually one or the other, they say.